In the 13th and 14th spots on Billboard’s Hot 100 we have two songs I featured the last time I looked at the charts — ‘The Middle‘ by Zedd, Maren Morris and Grey; and ‘Meant to Be‘ by Bebe Rexha and Florida Georgia Line. These two country-flavored hits were back to back in the top five in late May and they’ve stuck together lower on the chart. At #15 is another (one-time) country artist, though it’s been awhile since Taylor Swift got her twang on. In fact, I think the best unexpected career move for Swift right now would be to put out another bona fide country pop album. As with Big Star’s ‘Thirteen,’ I knew exactly which song I’d feature for today’s number before I even started looking. Taylor Swift’s ‘Fifteen’ is lovely and iconic and certainly the best song ever written with this title. Swift is also in contention for slot #22 with, you guessed it, ’22,’ but I have decided to go with only one song per artist, so somebody else will get the nod in a week. I’m pressing pause on the Random Weekend in progress to peck out a few thoughts on the new Taylor Swift album, which I received in the mail Friday and have given a few listens. 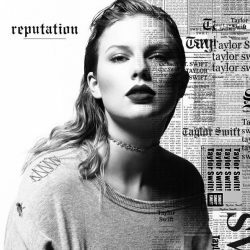 Reputation is pretty much what I expected based on the mostly disappointing pre-release singles. The good news is the rest of the album is a step up in quality, even if the subject matter is disappointingly more of the same. Dis tracks, love songs and meditations on what it’s like to be as famous as Taylor Swift. We’ve had a whole lot of discussion about Taylor Swift on this blog in recent weeks, mostly centering on her choice of subject matter (namely, herself). I maintain that Swift’s obsessive focus on her own personal drama diminishes her as an artist. Two days ago, Swift released the first single from her upcoming album Reputation, and I’m sorry to say it reinforces that negative impression. Our third Round Four matchup pits Elvis Costello against Taylor Swift. Swift has been a giant slayer in the contest thus far, propelled by some major fans and a whole lot of debate. She took out David Byrne in Round One, Tom Petty in Round Two and Simon & Garfunkel in Round Three (72/28). Costello topped Carly Rae Jepsen, then John Mayer and finally Michael Jackson (with a commanding 90% of the vote). Swift’s path has been a generational war, Millennials vs. Boomers, and that won’t change in this round. Can she continue to topple the oldsters on her way to the Final Four? Or will Costello prove too tough a foe? Closing out the week with the fifth Round Three matchup in Montauk Madness, we have the odd pairing of Taylor Swift vs. Simon & Garfunkel. Two of the more compelling Round One Montauk Madness matchups pitted pop (and pop culture) sensations Beyoncé and Taylor Swift against Tom Petty and David Byrne, respectively. Petty won his battle in one of the closest Round One contests, picking up 56% of the vote. Swift had an easier time dispatching Byrne, netting 88%. Now they face off against each other.